Tripping and Stumbling while following Jesus: The American "Race." As I understood it, Zimmerman was already out of his car following Martin when he called 911. At that time, according to Zimmerman, he turned around and started back to his car, at which point Martin jumped him. Be this true or not, I'm not sure we'll ever know for certain. As for President Obama, I wouldn't say that I hate the man. Even though I never voted for him and am from an opposing party, I did wish him well and very much so wanted for him to be a good president. I don't think he has been though. I think he's spent and wasted way too much money, hasn't focused nearly enough on improving the economy, pushed through a healthcare bill that (despite it having some merits) isn't worth the paper it's written on, has poorly handled foriegn affairs, has become plagued in one scandal after the next, and has been one of the most divisive presidents we've ever had, constantly pitting one group against another (black against white, poor against rich, young against old, gay against straight, etc). For those reasons, I am not a fan of his. But that doesn't mean that I hate him whenever I disagree with him or whenever I talk about him. As a person, I'm sure he's okay. Just not as a president. 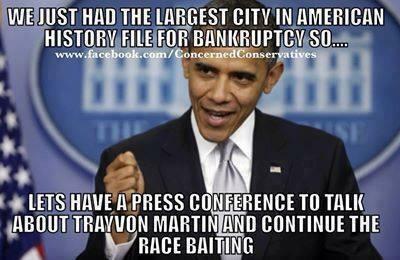 As for his speech the other day, I thought it was race baiting, even though he did make certain good points. To begin with, I thought he could have tried to ease some of the racial tensions by pointing out our similarities. He didn't do that. He stereotyped all white people as being afraid of blacks, locking their car doors and the like. Heck, I've done that while white women walked too closely by. If I don't know a person and I think they're getting too close to my car, I will lock my door, no matter what their skin color is. This, too, I thought revealed how he sees too much through race. But that aside, he questioned the outcome of the trial, sypathized for the family of Trayvon Martin while saying nothing about Zimmerman's who have assuredly been through a lot of grief as well, and even inserted himself into Martin's place. For a president residing over a country so split on the outcome of this trial, he sure was one sided in many regards. That was my key problem with the speech. One other problem I had with it though was the timing. He waited a week after the trial to say anything, and it just happened to be right after Congress had had more hearings about some of the scandals under him. It just seemed like he was inserting himself into the whole thing purely for politics sake, as a distraction, rather than because it was the right thing to do. And that seems to be a repeating pattern for him. #1. It is true that we will never know who threw the first punch, OR where George was when he made his first call. 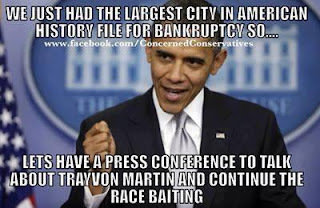 What we do know is that he made his first call in one place, and then shot Trayvon in another place quite a ways away. This means that he obviously kept following him after the dispatcher told him to back off. It may not have been illegal, but that choice will be on his conscience forever. #2. Here's a thought that I haven't heard to many mention yet; (Other than the President's key question to the nation) Put yourself in Trayvon's shoes. Let's say that you are walking down the street, minding your own business. You notice that some stranger is following you...and he keeps following & following. What would you do? This person following you may simply want to sell you tickets to fireman's ball. OR, he may be looking for a sacrifice for Lord Satan. You don't know. So what would you do? If it were me, I'd probably pull a Trayvon, too. #3. And that is what gets me. Few of us want to even hear the other person's perspective, let alone try and empathize. When the other person gives their perspective...like the President did, we call it "Race Baiting" and being divisive. The other side is guilty as well. #4. There is nothing new under the sun. Think back to all of the "Scandals" in the Bush administration...and Clinton's, and Bush 1...and Reagan, and so on & so on. B) The Republican party begins rejecting all sorts of stuff that they had been for before the election, simply because the President wants it. The best example is Obamacare. (Go to Google and type in "The healthcare blog, Dave Durenbuger) Dave was my REPUBLICAN Senator who was the main drive behind that bill back in the early 90s. it was the Conservative Republican response to Clinton's health care ideas...which were more govt. controlled. It also had the blessing of The Heritage Foundation...not exactly a Lefty organization. While the healthcare law is deeply flawed, it would be helpful if the Republicans sought to reform THEIR OWN IDEA instead of wasting my tax dollars voting 39 times to repeal it. And I just love that. They can't get anything done, can't compromise, can't even pass their own immigration bill...but they can vote 39 TIMES to repeal a law knowing full well that their vote will go nowhere. E) Finally, David Brooks (Conservative) made a comment 2 Fridays ago that I thought was apt. He said it was interesting watching a political party commit ritual suicide. The Republican Party needs to ask itself the following question: "Why should anyone who is not rich, white and really angry vote for us?" I'm very serious about that question, because the demographics are against them. I left out "Religious Conservatives" because they are dying off and the younger generation simply doesn't care about abortion so much, and certainly not gay marriage as we now see. The Republican party is dying, and only a few of them realize it. I would highly recommend a book to you. It's called "Un-Christian" by the Barna research group. It came out in 2007. I think it should be mandatory reading for all Evangelicals. You can go to their website and read one of the chapters for free. Okay, Joe, let's do this thing. #1. Neither of us was present the night Trayvon Martin was shot, so neither of us can have a perfect knowledge of what happened. We can guess and theorize all we want about where exactly everybody was positioned and when and all of that, but there is no way for either of us to know 100%, beyond any shadow of a doubt, what happened. #2. If I had been Trayvon Martin, my instinct wouldn't be to turn around and start beating the crap out of somebody I thought was following me. Instead, I would have either ran on home, or I would have used my phone to call the police. But turning around and confronting somebody following you, who you don't know, is just incredibly stupid. Just as stupid as Zimmerman following behind Martin in the first place. But, no, I would not have done what Martin did. #3. I don't have any problems whatsoever with someone stating their opinion, but when you are President of the United States, what you say and do has an enormous amount of influence. So when the President painted Trayvon Martin as a saint who was stalked and shot in cold blood, and then tells the whole country that he thinks the justice system failed Trayvon (when there is absolutely no evidence at all that it did), then I do have a problem with that. And I do think the president was simply playing to the crowd, rather than doing what any great president would do which is try to ease tensions and bring us all together. #4. You are right that other presidents have had scandals. However, I can't remember the last time any of them had more than three or four going all at the same time. And note that I did not just say it was the scandals that I dislike about this president. It is the scandals on top of a whole mountains worth of other things. #5. Far be it from me to say that the Republican Party is perfect. It isn't. However, their faults do not excuse the faults of the Democratic Party, nor justify them. You mention the healthcare bill originating as a Republican thought. My question to you is, so what? It was an idea used to counter what Clinton wanted to do in the 90's. However, it has never seriously been considered as a nationwide healthcare plan by Republicans. If it had been, don't you think they would have pushed for it at any of the times in which they've had power since the fight with Clinton? As for reforming the law, the House actually has attempted to do this several times. However, the Senate has refused to take up any of their legislation passed and Obama has threatened to veto any changes to the law. With that, how can they improve it any? And yet, while you scream it was low taxes and unpaid for wars that got us into a financial mess, you fail to recognize that the Democrats controlled all of congress for two years leading up to the mess. They were warned plenty by Bush and other Republicans that Fannie and Freddie were going to go bust, and yet Barney Frank and other Democrats sat on their butts and didn't do a single thing to try to prevent it, all the while telling people all was good. As far as I'm concerned, there is plenty of blame to go around with both parties on that issue. As for the Tea Party, I am not particularly a fan. However, I do like that they want us to at least attempt to operate within a budget and to uphold the constitution. You blame Republicans for the mess, yet when they try to clean it up, you say they're wrong. I don't get that. Obama has doubled our deficit since becoming president and yet the deficit is all the fault of Republicans? I mean, what I hear you saying is that it was Republicans only who got us here, and even if they have ideas to get us out of a mess, it doesn't matter, they should never be listened to again. All the while, Obama just keeps doing what Republicans had been doing wrong, getting further and further in trouble. And if you seriously think the Republican party is dying then you couldn't have followed politics as much as you state. Go back to the late 80's and early 90's. Back then, people thought the same thing about the Democratic Party. People also said we'd never have another Republican president elected after Nixon. I mean, come on. If history has showed us anything it is that there are times when one party is better than the other. But that does tend to fluctuate. As for your question (Why should anyone who is not rich, white, and really angry vote Republican), I'd say because the Democratic party has failed a whole city full of black people in Detroit through their idiotic policies. I'd say because conservatives actually care about the life of an unborn person, actually caring whether or not a fetus can feel a scalpel tearing through its flesh. I'd say because it's the Republican party realizing how devestating Obamacare is going to be to our economy (I note there must be a reason why so many of the unions who supported Obamacare are now trying to back out of it). I'd say because it's the Republican party actually trying to prevent our deficit and debt from causing a complete economic collapse, much like the one which helped destroy Rome many centuries ago. I mean, i could go on and on here, but just those things alone I think speak volumes in themselves. A few thoughts: 1#. Again, you miss the point about what Obama was saying about "His" perspective on the trial and "Race" in general. He is speaking from the perspective of a black man in the U.S. Yes, that perspective often makes me very uncomfortable, and often angry. But as a white guy, I need to hear it...just as I need to hear the perspective of women, black & white. And the perspective of Asians, Latinos, etc. And, YES, they need to hear my perspective too. I think that from a biblical perspective, Jesus asks us to enter into relationship. This means that we need to listen more, and to to ask a lot of questions...and also to be comfortable not having all that many answers. #2. You're right in that parties do go into states of flux all the time, but I have never seen a party in such confusion as I have the current Republican crop. Here in Minnesota, we had an election for Governor going on 3 years ago. It was interesting to note that two Republican former Governors and one Republican former Senator refused to back the Republican candidate, and instead backed a former Republican then running on the Independence Party ticket. In fact, keep your eye out for the rise of the "Randians," such as Paul Ryan of WS, Ron Paul's kid, "Rand" Paul of KY, and the TEA Party in general. (Thankfully, my own goofball Congresswomen Michelle backman si getting out before the FBI busts her for her crooked presidential run) These folks are all followers of Ayn Rand's philosophies. I fear that her ideas will have a lot more influence in the Rep. party over time. You may know about her, but if you don't, start doing some digging. She was an anti-christ in it's purest form. A militant atheist who openly espoused the opposite of everything Jesus taught. She praised selfishness as the highest moral good, and said that the poor & weak were unworthy of her sympathy. This is the lady whom Paul Ryan makes all of his staffers read her book, "Atlas Shrugged." And he's a good Catholic boy. #3. You'll never get me to do much in the way of apologetics for the Democrats. Detroit is a perfect example of politicians refusing to take responsibility. #4. You touched on the Pro-Life movement. Here's my frustration with that. I truly think it is wrongly named. Unless you believe that life ends once the baby is born, then to properly be pro-life is to be concerned about the whole life of the child. These would a concern for "Creation Care," and allowing the kid to grow up with healthy air, etc., etc. Also, properly funded schools...particularly in poor neighborhoods. A social safety net that is generous, yet holds people accountable. (The Reps. haven't had a good idea on that since the 1996 "Welfare to Work" law, and the Democrats seem to want to throw money at everything without ever having accountability.) Without that being in the platform, then these folks should simply be called "Pro-Birth," because it's clear that after the birth, they simply don't care. One thing that truly infuriates me about the TEA-baggers is that every one of them I've talked to will utter the Satanic phrase, "It isn't the governments job to help the poor." Generally, after saying this phrase, they will then go on to bash poor people in America...even though most of them don't actually have any type of relationship with poor people. If a Christian says that, they need to repent! If Jesus is Lord, then he is Lord of all...every person, nation, government, business and corporation. And it is pretty clear that he will hold every one & everything accountable for how they treated the "Least of these." BTW: Have you bought a copy of my story series yet? You might get a kick out of it. Particularly the first half of part 3. Also, if you want to friend me on Facebook, let me know. 1) I don’t have a problem with the president giving his perspective. I agree that it is best to listen to the thoughts and ideas and beliefs of others. However, I don’t think the president, in that speech or at much of any other time, has tried to understand the thoughts, ideas, or beliefs of others. As president, it would have been nice had he not been so one sided. That’s why I did think he was sort of race baiting. As I said before, I thought he was just playing a bit too much to the crowd—to those who think like him—rather than trying to bring people of different beliefs together. 2) As for the Republican Party, I do agree that there are some major problems with it right now. It is somewhat divided, as I see it, between those who want to get her back where she used to be (concerning principals and philosophy), and those in the establishment who just want to go along to get along and get nowhere. And the tactics have been foolish in many regards by members of leadership on both sides of that division. Frankly, I thought the establishment candidate in this last election (Romney) was a horrible candidate in many ways. He was weak, refused to give a good argument, and had the personality of a brick. In many ways, he was a joke simply by the way he ran his campaign. And by association, he helped make all Republicans a joke. But that seems to be the way the current establishment wants to do things. The rest of the party is trying to go a different route wherein we actually abide by conservative philosophy, making our strongest case possible, and not giving in until there’s no other option. As for Ayn Rand, I don’t know about her at all, so I can’t speak about any of her beliefs. But if you wish to speak of morality, concerning either party, I could certainly tell you about some very unChristlike beliefs and behaviors from members on both sides of the aisle. 3) When it comes to demographics, the Republican Party certainly does have some work to do. As a gay man, I can say this with great certainty. They haven’t reached out very well to any minority group in the last eight years. I don’t believe it is because they don’t care though. I think it has been because they were being foolish about the numbers, especially concerning the electoral college map. It’s the same reason why Bush lost the popular vote in 2000 when he probably could have won it. He completely ignored CA, NY, and a few other states in which he didn’t think he could win. The result of doing that was that those whom he could have reached in those states, who probably would have voted for him, chose to sit at home, believing Bush didn’t care about them enough for them to show up for him. The result was that he lost the popular vote. Same with Romney. He didn’t think he could win a majority of minority votes so he just simply never tried that hard to reach out to them. Furthermore, I don’t think most Republicans actually look at anyone through the prism of race, ethnicity, or anything else. Frankly, I can’t think of any Republicans who do. We tend to look at everyone as equals, everybody having the same opportunities, and everybody having the same chances in life. I know this may sound like total BS giving the way the liberal media has tried as hard as it can the last few years to dispute this, but I honestly do believe it is true. When we speak, we aren’t thinking we’re just talking to angry, old, white, rich men. We are talking to everybody, wanting to appeal to everybody, and wanting to make a difference for everybody. Now, I’m not saying this is always true, but I think it is definitely in the mindset of most Republicans. At the very least, it is mine and that of most that I know personally. But having that mindset, and perhaps not speaking directly to one group or another, may indeed give a wrong impression at times. That is where I will commend Rubio and other Republicans who have began trying to talk more directly to certain groups. And over time, I do believe these groups will realize what we as a party have to offer them and will know that we honestly do care about them, and not just for their vote. 4) I think you are somewhat confusing what it means to be pro-life and what it means to be compassionate and caring. I am pro-life simply because I think each unique individual, no matter at what stage they are at in life, has a right to keep their life, and not have it unilaterally taken away from them for just any ole reason. With this in mind, I also do not support the death penalty. When it comes to abortion, in particular, I loathe it because in the majority of cases, it happens simply because the mother does not want the baby, and I think this is evil in its truest form; to end the life of anyone simply because you do not want it around. I will add that in cases where the mother’s health is at serious risk, abortion should be allowed though. But when it comes to the rest of an individual’s life, I do not think the Republican Party, as a majority, believes no one should ever be helped by the government. I’ll point to NCLB just as an example. Even though there was problems with NCLB, that was a serious effort on the part of Bush and Republicans to help improve education in this country, and as a teacher, I can verify that it did help improve learning especially among disabled and mentally challenged students. But the issue isn’t really that Republicans don’t believe in helping anybody. The issue is what kind of help we want to give people and how much help to give them. The argument that Republicans just don’t care though is ridiculous. When we fight Obamacare, it isn’t because we don’t want to help anyone. Heck, we’re fighting it because we believe if we don’t, a lot of people are going to lose their jobs, the healthcare they do already have and like will be taken away from them, and we’ll just end up adding a whole lot more to the debt—all things that will hurt people. We’re trying to help prevent that hurt. Yet, because we dislike Obamacare, we’re painted as not wanting to help in regards to healthcare at all, which is completely false. We have put forward many ideas, like opening up insurance exchanges across state lines, and opening up prescription drug exchanges with other countries to help lower costs, which have been consistently rejected by Democrats and ignored by the media. So, again, it’s not that we don’t want to help. We just disagree on what kind of help and how much help should be given. 5) I haven’t read your story series, but I’ll check that out. As for facebook, I’m not on it enough anymore to bother—I mean, seriously, I’ve only been on it like once all summer long. FB is the best way to communicate with me, but if that's not cool, send me your e-mail. (You're wasting your summer by not being in contact with me and other heretics) You can find my e-mail in the profile thingy.